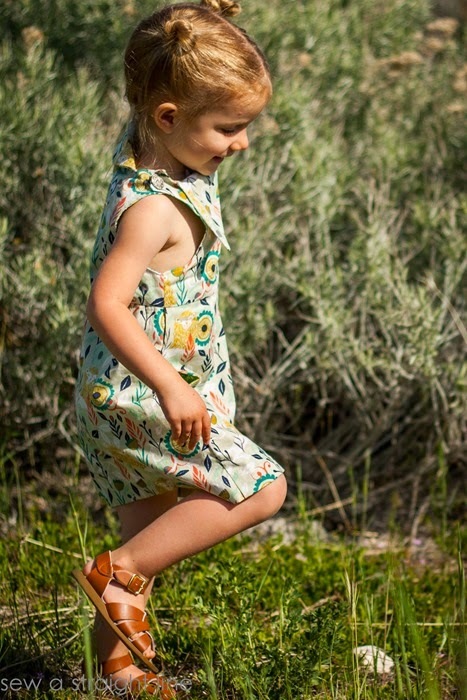 Today Sabra is with us sharing a fun twist on the Fresh Bloom Frock – so cute and unexpected! REad on to see. Hello and good morning! 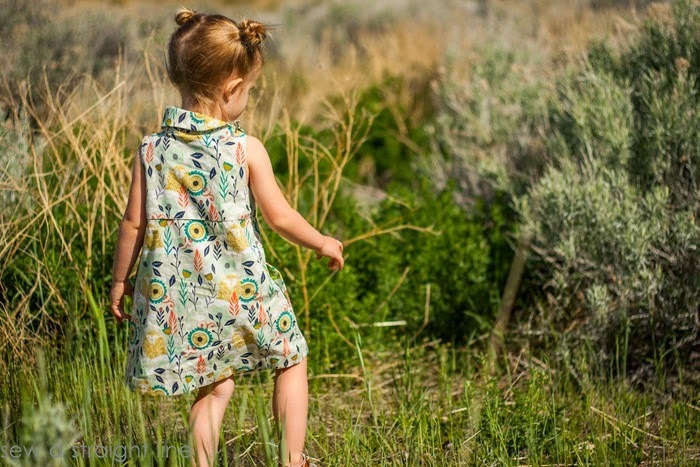 This is Sabra from Sew a Straight Line sharing one of my favorite Blank Slate patterns, the Fresh Bloom Frock. Today, I’m serving up the ‘Frock both in Original and with a little twist. First up, the Original. 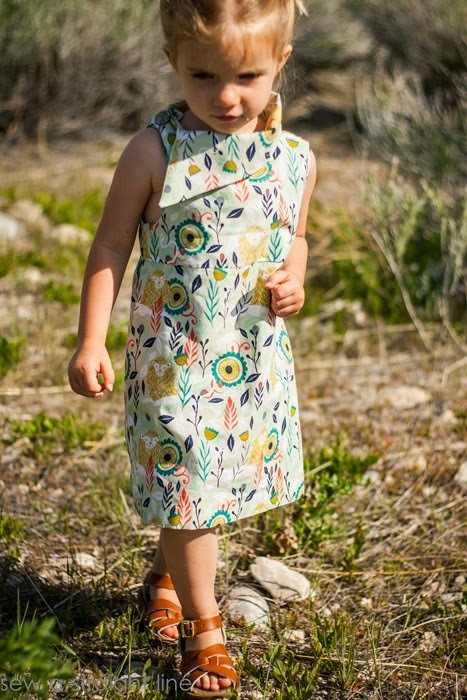 The Fresh Bloom Frock is a simple, sleeveless shift dress in sizes 18m-8 years, but it has some really great design elements that make it unique and interesting. The collar is asymmetrical, with a deep angle off to the one side. If you follow the pattern, you will get the angle to the opposite side than what I made here. I cut my front bodice piece backwards, so my collar opens on my daughter’s right, instead of on the left as the pattern intends. Not a big deal, just thought it worth mentioning. I really love the asymmetrical collar, especially how it wraps around to the back at a slight curve. It’s just really different and beautiful. We get comments and complements on this dress all the time. 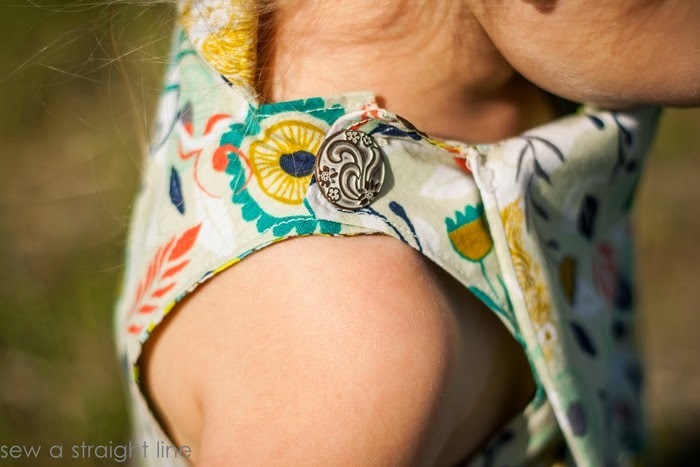 The neckline closes with a single button at the one shoulder. 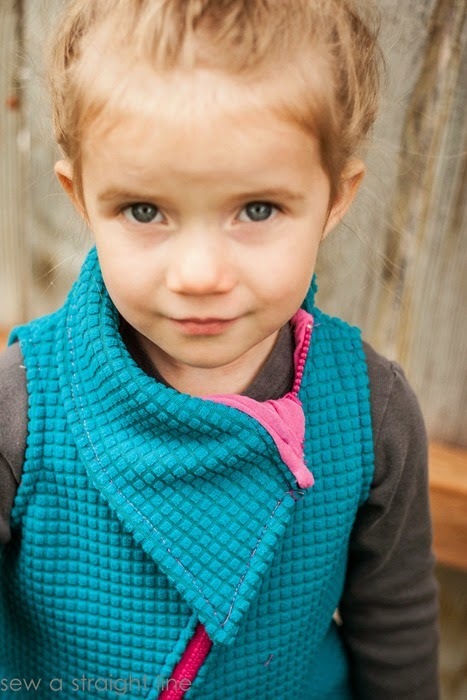 Super easy to take on and off, and really easy to sew, with no complicated closures. There are also in-seam pockets that I totally forgot to photograph. But they are there, and they are so well drafted, that you can’t even see them if you don’t know about them! Just a sweet, unique dress, perfect for spring and summer. But I wanted to play with the pattern a bit. 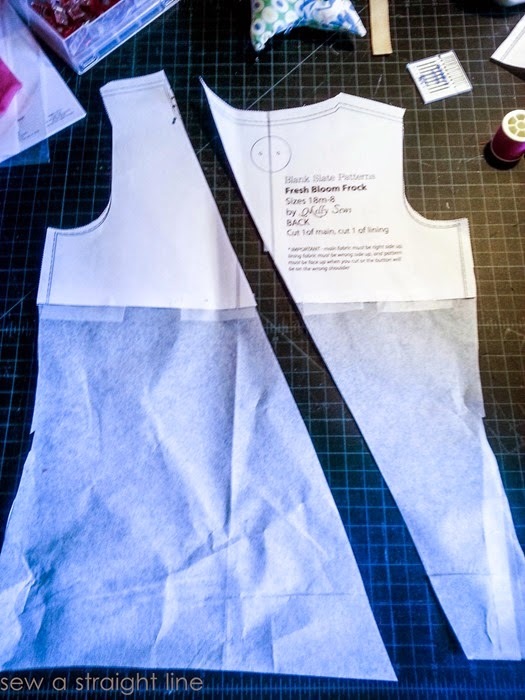 For my twist, I slashed the front bodice at an angle, and added length to go from a dress to a vest. 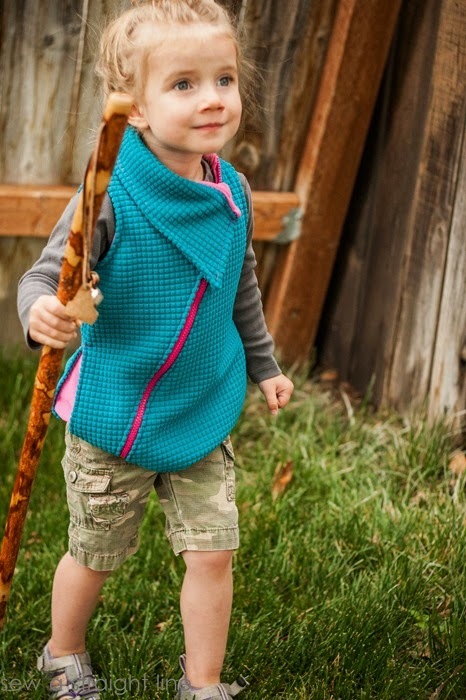 We spend a lot of time outdoors, and my daughter’s favorite activity is hiking. 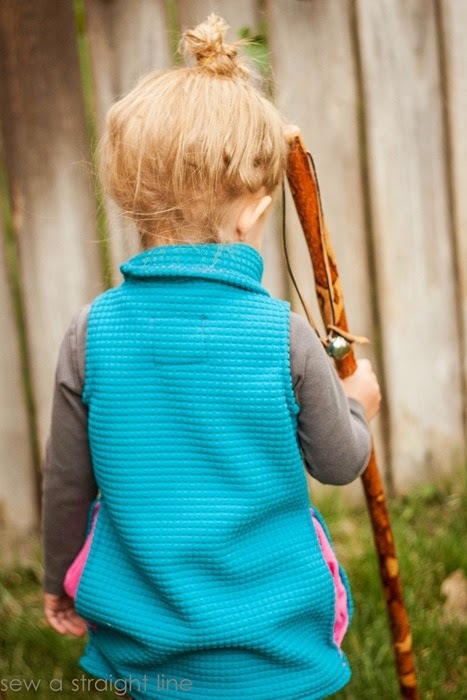 I’m always on the lookout for patterns that can work for adventure-wear for myself and my kids. I picked up some fun outerwear fabric a couple of weeks ago from a local shop, and it seemed like the perfect pairing with the Fresh Bloom pattern. 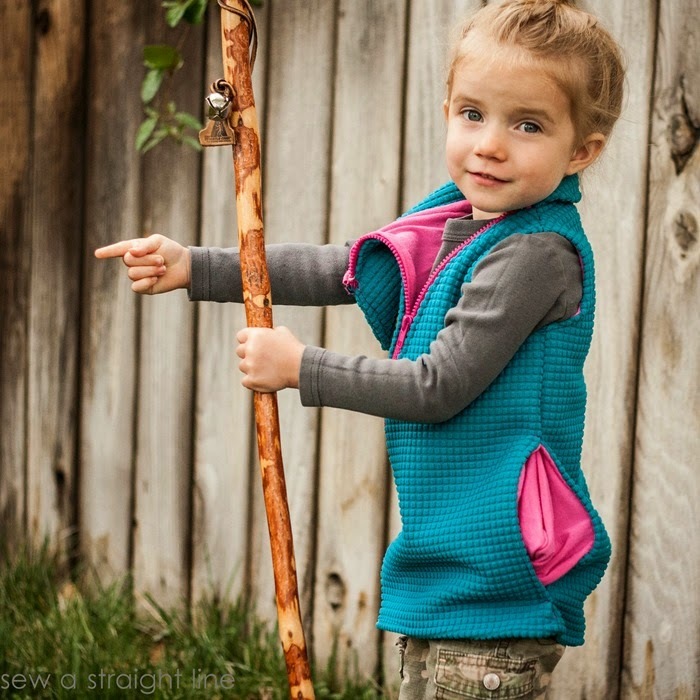 I made the vest too big, adding too much length and tapering out too much at the sides. I also need to tack the pockets down, since they peek out quite a bit. This isn’t an issue in the dress, since the pockets are sewn flat into the waist seam. also, I’m pretty sure the fabric is intended for this nubby side to be worn against the body, to hold in heat. But I didn’t want to hide that fun texture of the fabulous teal color. So I stuck with the fun-side-out, and added a bright pink jersey lining. I got the collar on the intended side this time. 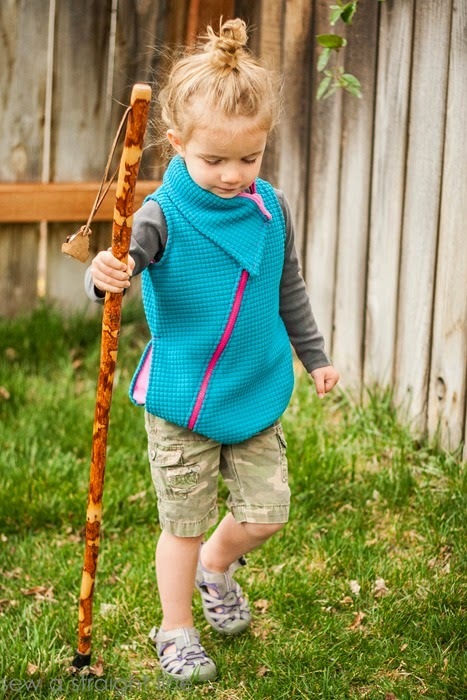 Even too big and with pokey-outey pockets, I’m so happy with how the vest turned out. All the fun of the asymmetrical collared frock, but in a completely different form. I love a pattern that works fabulous as written, and also holds potential for playing around with my own ideas. 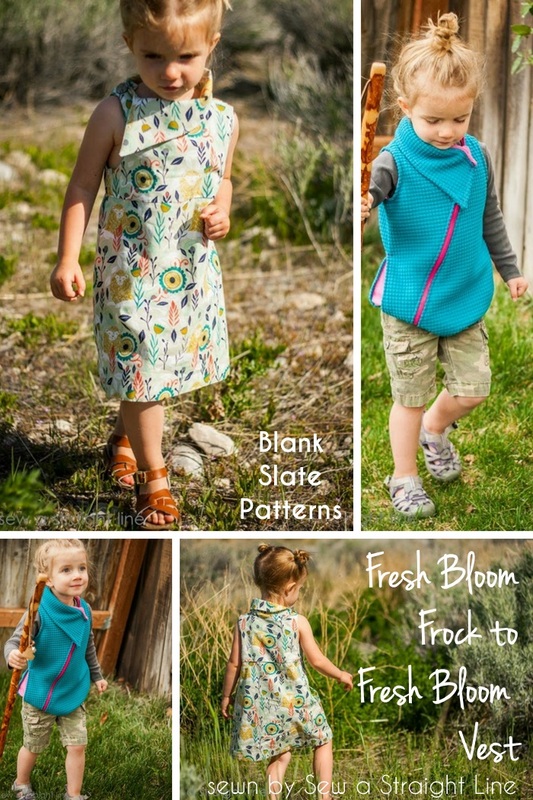 All of Blank Slate patterns are perfect for this, including the Fresh Bloom Frock. 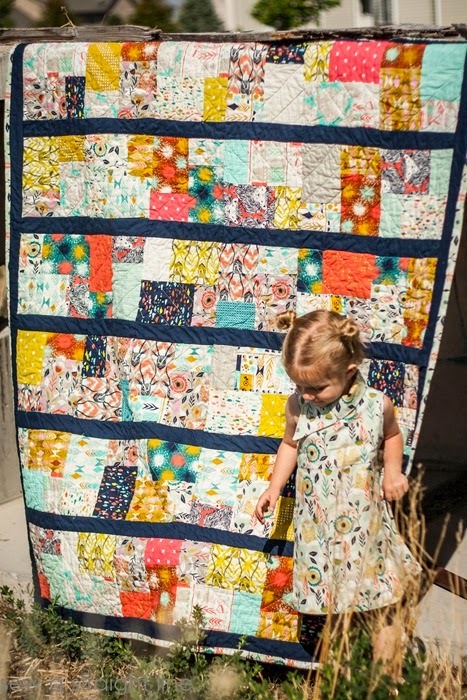 And I’d love to show you what I’m working on over on my blog, Sew a Straight Line, including the quilt I made that just so happens to match my daughter’s Fresh Bloom Frock. Thanks so much for letting me visit today, and happy sewing!